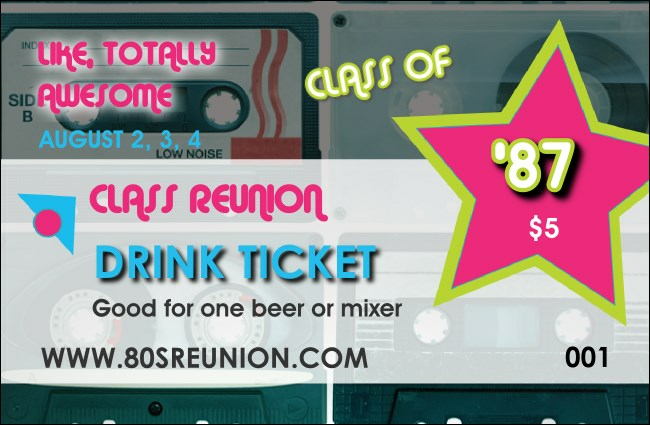 Raise a glass to the most righteous decade ever with the Totally 80s Drink Ticket. Printed on high quality card stock, this ticket features individual numbering for your guests, a fun bright pink star and rad tapes in the background. Combine with a Totally 80s Event Kit for a totally awesome event! Need posters? Fliers? VIP Passes? Check out the selection or design your own at TicketPrinting.com!